Our success has been noticed by the “big kids” on the playground. 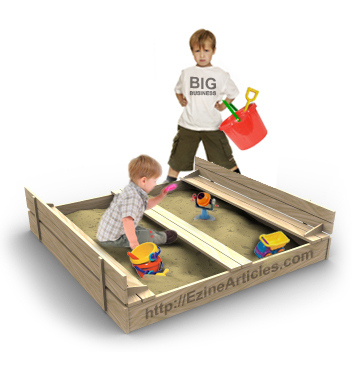 Here’s how you can survive and thrive when they come to play in our sandbox. For the last 10 years, EzineArticles has surfed a wave of relative anonymity on the Internet. Our members have enjoyed the fruits of an online marketing strategy that has gone relatively unnoticed by big business. While the huge corporations of the world have been spending their money in the time-tested traditional advertising and promotions sandbox, our incredibly cool and effective article marketing sandbox was quietly being built by small, but motivated, entrepreneurs and organizations. In essence, for the last 10 years or more, they’ve played in their sandbox and we’ve played in ours. As the nature of traditional marketing, advertising and promotions continues to change, big business has started to notice the power of small nuggets of Internet-based textual information for driving sales and fostering customer loyalty. For proof of this, you need only look to the rapidly growing number of Fortune 500 Facebook Fan Pages and corporate Twitter accounts. What you’ll see is that the big kids are coming to our side of the playground. Once they establish their foothold here, it won’t be long before they start digging into the power of article writing and marketing. Small companies and entrepreneurs like us don’t have the resources to take on these marketing behemoths in a head-to-head turf war; nor should we try. Let’s face it, they’re a lot bigger than we are! What they’ll be bringing with them is a lot of depth and a lot of money … but not a lot of breadth. In other words, each of these monster marketing machines will deeply understand one thing – their product(s) – and they’ll be able to throw a lot of effort in that direction. For the sake of our sandbox analogy, they’ll be coming to our sandbox with one really nice shovel and a huge bucket – and those are the only toys they get to play with. They can dig big holes and move a lot of sand, but that’s about it. We, on the other hand, bring with us a very intimate knowledge of each of our countless individual niches. While the big kids will be forced to focus on their particular products or services in the tight constraints of their brand, we’ll have the luxury of quickly and nimbly adjusting our niche(s) and marketing approaches to take advantage of trends and changes in the marketplace. Again, for the sake of our analogy, we have a pile of assorted sandbox toys at our disposal. If one doesn’t work, we can quickly change to another that will … and probably have a lot more fun doing it! As article writers and marketers, we need realize that our sandbox is about to change forever and it’s going to get a whole lot busier. This change does NOT signal the end of our incredibly cool sandbox, though. Provided we take advantage of what we have that they don’t, there is a world of opportunity opening up as the big kids start playing with, and appreciating, the local kids with their pile of assorted sandbox toys. To survive, and thrive, under this new paradigm you’ll need to be prepared for the changes that are coming. But with a little forethought, planning and action, everyone can ultimately succeed. Face the Truth – It’s not a question of IF big business will start utilizing article marketing. It’s WHEN. Article marketing works, and they know it. Identify Your Competition – Think about your niche(s). What big companies could benefit by doing article marketing in those niches? Research those companies and try to identify when and how they’ll be approaching your target market. Refine Your Niche(s) – Focus on the long tail of your niche(s) and refine your articles to those laser-sharp niches that exist outside of, and beyond the reach of your big-biz competition. Formulate a Plan – Once you’ve identified your potential competition and the niche(s) you can dominate, formulate an article writing and marketing plan that capitalizes on what you’ve discovered. Key in on your strengths and their weaknesses. Execute! Execute! Execute! – Write! Write! Write! Your plan’s in place, now build your article inventory to firmly entrench you as the expert in your niche. Simultaneously, build and refine the support structure for your articles – things like your landing page(s), resource box(es), social media presence, traditional marketing tools, etc. Be Vigilant and Tenacious – Keep an eye on your competition and be ever-vigilant for new-comers in your niche. The initial thrust may come from mid-level businesses or B-list companies you may not have identified in your research. Be Flexible – Don’t become so attached to a laser-defined niche and article writing/marketing style that you’re unable or unwilling to change. Have contingency plans available that will allow you to shift your niche and style should the competition get too fierce. Be Quick and Nimble – In traditional business, you often have months or years to react to changes in your market. In the online world, this time-line gets significantly compressed. You may only have a few weeks or months to get out of the way and avoid being run over by the big guys. Be Open to Opportunity – Along with this change will come opportunities to partner and collaborate with big-business article marketers. There will be employment and consulting opportunities for people who do what you do. And at the very least, there will be the opportunity for the small article marketing fish to feed on the substantial leftovers of the bigger, messier fish. Grow – Stagnation will mean death in the new paradigm. In order to successfully compete with large organizations you will need to be in a state of constant growth. You will need to be constantly evaluating, refining, planning, and executing to adjust to the ever changing article marketing landscape. Take advantage of learning opportunites, like this Blog, to stay on top of the latest trends and changes in our industry. Make no mistake, this is a BIG DEAL. Times they are a-changin’ and you can do one of three things: 1) Become friends with the new kids coming to our sandbox, 2) stay out of their way, or 3) pack up your toys and go home. The choice, inevitably, is yours. And as always, we’ll be here to help. So leave a comment and let us know what’s on your mind. Then get back to work on these 10 steps – I see the glint of a big red bucket coming over the horizon. GREAT topic. I’ve been actually thinking about this lately because I was watching the Shark Tank and one of the investors said he could build an internet business from zero to $50 million in no time. That comment had me wondering how he does it. I know it’s because he’s got big bucks to put in – maybe a few million to ramp it up – and I figured most of the promotion part is PPC. Definitely a good thing to be thinking about and planning for, thanks for the tips! On the other hand, it’s exciting too. If you’ve been using article marketing successfully and are a little daunted, consider that you have smarts the big companies will have to hire. It took you time to learn how article marketing works, and now’s the time to use your experience. Step on the gas — anything they can do, you can do, and you can do it faster and better. Awesome advice! I just submitted an article to Ezine (you guys rock by the way!!) on article marketing. play in the sand box only adds to the excitement I feel. I have owned large businesses in the past, I have played with the big boys and I am truly anxious to do it again..
Hi Don. I like the cut of your jib! I have worked for big busisness, run medium sized and worked as a consultant to big, medium and small. This is the first time I am going into the creation of a new business. I am going to use article marketing as an arm of my marketing an online solutions based business in a number of fields. I too am looking forward to mixing it again with the big boys. They may have ready cash but often lack the drive and imagination to take advantage either of it or their product/service. Have courage is right. The long tail is a real thought here for my niche. I’m going to give these suggestions a lot of thought. Thanks for the heads up. I’ll be studying and following every response to this blog post. If the big boys are coming, then that should be confirmation that article marketing works. Great points in the Ten Steps For Succeeding In Tomorrow’s Article Marketing Sandbox. Reading them again, it appears that these strategies should apply with or without the big guys. You hit the nail on the head with your final point. Whether the big boys are in our sandbox or not, good business strategy is good business strategy. G’day Chris, You’re right again. “When elephants fight, the ants get trampled.” The big guys will trample us to death if we try to compete with them directly. But if we get our strategy right we can do very well. The whole process is brilliantly explained In “Marketing Warfare” by Al Ries and Jack Trout. First published in 1986,it’s still relevant today. …and writing articles is such fun too! To a newbe (me) that IS encouraging. I hang on all the specific advice that does not cost! I’ve been swimmig in the shark tank for a long time in a financial niche. They are whales, but you can still be a dolphin. IMO and experience the crumbs the don’t bother with have been my feast. Perhaps we have all heard that song “The Ant and the Rubber-tree Plant..”? Anyone who has ever had an Ant infestation knows how troublesome they can be! So…this little Ant plans on biting back and I can do it faster, just as well and I have more reason to bite harder. Anyone else heard of fire-ants? Or how about Bulldog Ants? Oh boy, do THEY ever hurt! I like that Jan. Well stated, I’m going to bite back, too. I know the usual worry is being overshadowed by the “bigger guy” however, I don’t think there needs to be a huge concern if you use a bit of strategy. I love niches for that reason, and the fact that you can gain tons of traffic to a main site as well as grow it, just by adding relevant niches to your main site by linking them together. Great article about writing articles. I am new to marketing through blogging and article writing and am finding the process very challenging. Love this post. So true that the “big boys” are recognizing the power of article marketing. I’ve already had some music company folks inquire about my services. I suggest everyone dig in and really start trying to penetrate their respective marketplaces. It may be that Google is preparing the big boys lunches for their first day in the sand. Noticable changes with integration of advertising networks has me worried, I think entering the internet market in any way will start to cost more than a side hobbie. As usual times change and you have to work it out.